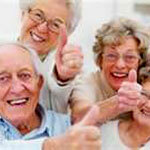 Chaverim is the Federation’s monthly social hour program for seniors. program for seniors. This program provides seniors an opportunity to socialize and hear a program, enjoy a light snack and engage in a discussion. For more information please contact us. In addition, an outreach program delivers special packages to seniors in the community at Rosh Hashanah, Chanukah, and Passover. This visit provides an opportunity to connect with those who are at home or who reside in either an assisted living or long-term care facility. For active retirees, the Federation offers Knosh and Knowledge, a once a month gathering,either a local coffee shop or an outside location, to socialize and hear from guest speakers on a wide range of topics. Jewish Federation of Springfield, IL 1045 Outer Park Dr.